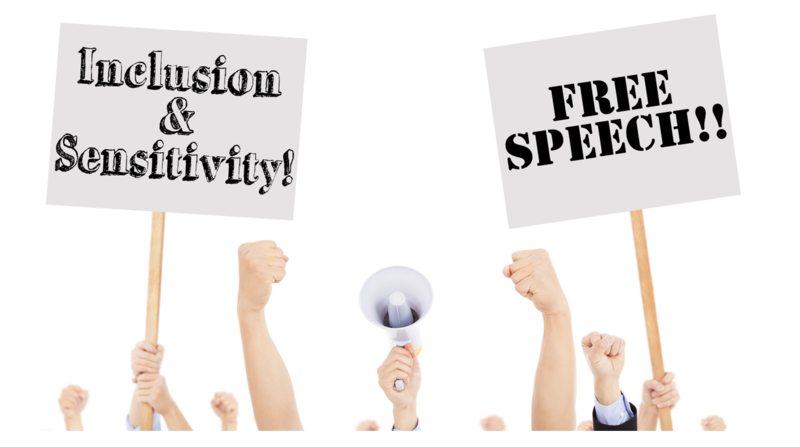 Free speech is not merely a political tool of the “right” or the “left” but rather an integral civil liberty necessary for an informed, democratic society that seeks social progress. Casting free speech and the First Amendment as opposed to social justice limits the ability of activists to push for change and separates two causes that are inherently linked. Over the past few years, campus politics about free speech have captured the attention of national news media. Protests have been held, angry comments have been posted, and students on both the left and the right have been presented with the polarizing choice of free speech or social justice. In reality, however, social justice and a robust commitment to free speech must go hand in hand. The First Amendment guarantees that “Congress shall make no law… abridging the freedom of speech, or of the press; or the right of the people peaceably to assemble, and to petition the government for a redress of grievances.” This principle of radical tolerance for new ideas is the very heart of any social movement from Black Lives Matter to the infamous “alt-right.” Without these legal protections, powerful student-hosted events such as “die-ins,” anti-police brutality candlelight vigils, and sidewalk chalking in support of a presidential candidate could all be prohibited. While such a uniform ban on expressive activity would be sure to secure the support of those advocating explicitly for “social justice” (however it may be defined), a common argument from students is that their speech is not currently threatened by the government or campus administrators. Therefore, it is not in need of First Amendment protections. This argument, however, fails to take into account the crucial addition that their speech happens to be favored only at this specific historical moment in the select geographical context of their university. In ceding power to censors, even well-intentioned ones, students are assuming that institutions will always agree with them. This is a short-sighted position, as tomorrow’s politics are unlikely to be the same as today’s, and the ideas currently celebrated could just as easily be censored. Even if the institutional politics of universities were guaranteed to remain unchanged, a commitment to free speech is still necessary for any organization that works to promote social progress. Without free speech, these organizations would be unaware of the very issues that most need their attention. Take, for example, micro-aggressions and current policies that seek to punish students — often through bias incident reporting — for “saying the wrong thing.” If students never said the “wrong thing,” how would any organizer ever know that those were issues that still needed to be addressed on campus? In short, free speech ensures that students not only have the means to make social progress, but also that communities are aware of the changes that still need to be made. Moreover, although free speech is cast as a partisan issue by both the left and the right, the protections afforded by free speech work in favor of both parties. A prime example of this is the Campus Free Expression Act (CAFE Act) in Missouri, signed by Republican lawmakers, that prohibits public universities statewide from limiting student speech to “free speech zones.” While this act was sponsored and supported by “the right,” this same act protected the Concerned Student 1950 protests that not only triggered change at the University of Missouri, but also contributed to a larger discussion about institutional racism on campuses. Without the free speech protections afforded by the CAFE Act, those protests would not have been able to dominate campus and would instead have been subjected to a so called “free speech zone” that would have restricted student activism. Free speech is not merely a political tool of the “right” or the “left” but rather an integral civil liberty necessary for an informed, democratic society that seeks social progress. Casting free speech and the First Amendment as opposed to social justice limits the ability of activists to push for change and separates two causes that are inherently linked. Students, especially student activists, of any political leaning must embrace free speech to realize the social change that they claim to be working for.